Nikuman-kun’s sister officially joins the cast. 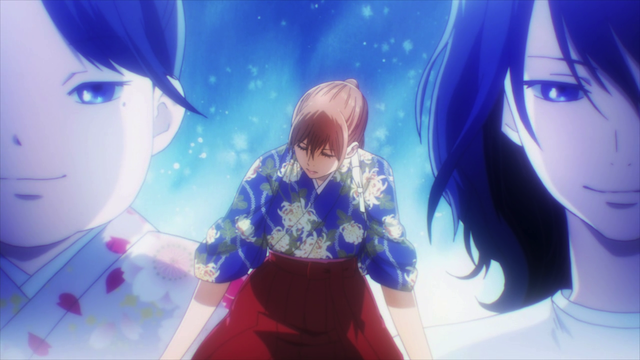 Chihayafuru season 2, episode 5 begins the match against Hokuo Academy. Not only is this the final round in the Tokyo Regional, but it is a grudge match for Hokuo, since Mizusawa High denied them the opportunity to compete at the National championship at Omi Jingu last year. As such, this had to be a two-parter. What I wasn’t expecting was the appearance of several minor characters, and the strong foreshadowing of a Meijin battle to come. Retro-kun (right) got himself a girlfriend! When I heard about Hokuo having a secret weapon, I assumed it was some new player. Then the show performed some brilliant misdirection. First there was Hokuo’s strategy of targeting Taichi, Tsutomo, and Kanade (the three weakest players), and then there was the reveal that Retro-kun’s girlfriend is Nishida’s big sister! We met her unofficially in the season 1 recap episode, and I never expected to see her again. Neither of those were Hokuo’s secret weapon, but they did help to develop Retro-kun as a side character. Regardless of how bizarre he comes off, he cares about Karuta, and wants to win the right way, and that’s alright in my book. Kanade Ooe demonstrates that Mizusawa High has a secret weapon of their own. Mizusawa is at a disadvantage, because Akihito Sudou, who played with Hokuo Academy until recently, is the reader for the final round, thus Hokuo is already accustomed to playing to his rhythm. The Mizusawa team, however, are unexpectedly assisted in the final match by Miyauchi-sensei; she has made each member a tasuki, which is a used to tie up the flowing sleeves of the hakama that the Mizusawa team wears. I have seen tasuki before in period dramas, so their sudden appearance was one of those “of course!” moments. 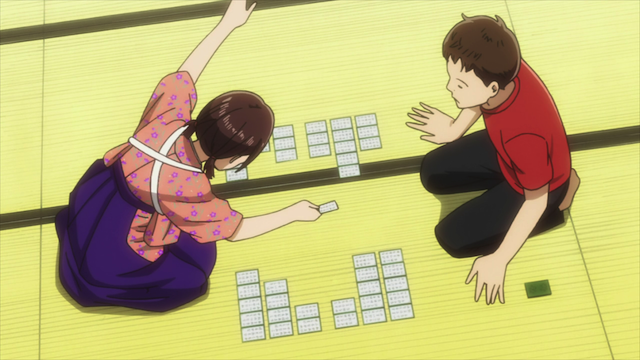 People wear hakama’s these days as formal attire, not for wood chopping, so using a tasuki wouldn’t normally leap to mind, but it obviously is a practical adaptation for Karuta matches, and it is easy to see how that would improve their play. Oh, yeah, and Go Kana-chan! Chihaya Ayase and the many faces of Shinobu Wakamiya. The best thing about this episode, I thought, was the energy it put into foreshadowing the Meijin tournament. That’s a whole other tournament, and we are still in the middle of this one! I was thinking we might get to see Shinobu during the High School Nationals at Omi Jingu, but already Chihaya is shown to be working toward that rematch, and we even had call-backs to the discussions about the reigning Meijin, Hisashi Suo. This is getting very exciting. Not only do we have an exciting match going on that I want to see, not only can we look forward to the High School Nationals, but they are ALREADY building up the story of the Meijin tournament! Thoughts on the match: At the close of the episode, Nishida has already lost his game. This obviously puts Mizusawa at a disadvantage, but that was a straight match against one of their two A-class players. Despite ending the episode with a five card disadvantage, I think Chihaya will win her game against Hokuo’s other A-ranked player. Kanade is the one Mizusawa player they have shown as having a strong position, so I think she goes on to crush her opponent. That means only one win is required between Taichi and Tsutomu. I would imagine that Taichi is stronger than Retro-kun, since he has been within striking distance of A-class for so long. 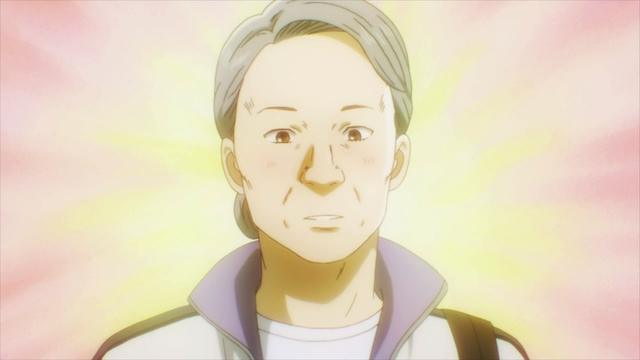 Miyauchi-sensei, the advisor of Mizusawa High’s Competitive Karuta club. i think this episode showed how much of a strong character chihaya is. she is not fazed with nishida’s lost. she was so focused. i think kanade’s wrong to think that chihaya was focusing on winning her battle with shinobu and wasn’t paying attention on their battle at hand. being simpleminded (well, in a good way), chihaya doesn’t even know that she’s using techniques from the current master and queen. she just wants to be stronger and win… i can’t wait for next week’s episode. Yeah, I think her opponent is misunderstanding her outlook. I think she is aiming for Shinobu, but that doesn’t mean that she isn’t aware of the game she is currently playing. She is so good she can easily beat ordinary players, so she needs a match against an A-class opponent to test her accuracy. That doesn’t mean she is unaware of the current match, though. She had just given that lecture about giving it your all, and so I think she will do exactly that. Amakasu is going to lose this game. 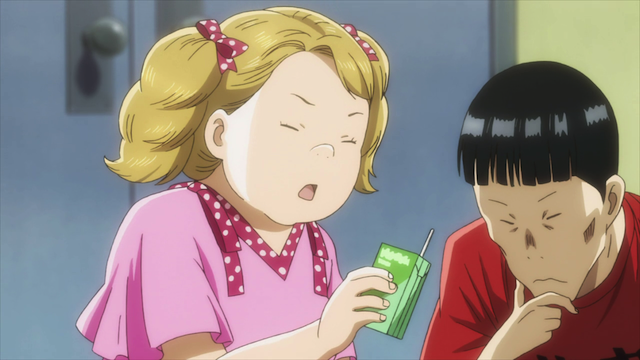 Back in the first season, Chihaya met an opponent who pointed out that she was solely relying on speed. That was when she realized that she needed to tighten her game, and make fewer mistakes (wrong cards). Now she knows she needs more than one skill to rise to the top, and she is consciously developing them.